^ 1.0 1.1 1.2 1.3 What Is Bronchitis?. August 4, 2011 [1 April 2015]. ^ 2.0 2.1 2.2 Albert, RH. Diagnosis and treatment of acute bronchitis.. American family physician. 1 December 2010, 82 (11): 1345–50. PMID 21121518. 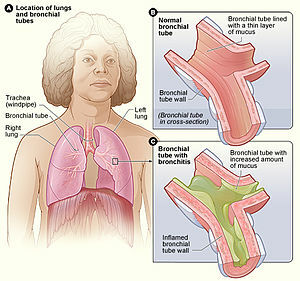 ^ What Causes Bronchitis?. August 4, 2011 [1 April 2015]. ^ 4.0 4.1 Tackett, KL; Atkins, A. Evidence-based acute bronchitis therapy.. Journal of pharmacy practice. December 2012, 25 (6): 586–90. PMID 23076965. ^ How Is Bronchitis Treated?. August 4, 2011 [1 April 2015]. ^ Vestbo, Jørgen. Diagnosis and Assessment (PDF). Global Strategy for the Diagnosis, Management, and Prevention of Chronic Obstructive Pulmonary Disease. Global Initiative for Chronic Obstructive Lung Disease. 2013: 9–17. （原始内容 (PDF)存档于2013-10-04）. ^ Reilly, John J.; Silverman, Edwin K.; Shapiro, Steven D. Chronic Obstructive Pulmonary Disease. (编) Longo, Dan; Fauci, Anthony; Kasper, Dennis; Hauser, Stephen; Jameson, J.; Loscalzo, Joseph. Harrison's Principles of Internal Medicine 18th. McGraw Hill. 2011: 2151–9. ISBN 978-0-07-174889-6. ^ Decramer M, Janssens W, Miravitlles M. Chronic obstructive pulmonary disease. Lancet. April 2012, 379 (9823): 1341–51. PMID 22314182. doi:10.1016/S0140-6736(11)60968-9. ^ 9.0 9.1 Rabe KF, Hurd S, Anzueto A, Barnes PJ, Buist SA, Calverley P, Fukuchi Y, Jenkins C, Rodriguez-Roisin R, van Weel C, Zielinski J. Global strategy for the diagnosis, management, and prevention of chronic obstructive pulmonary disease: GOLD executive summary. Am. J. Respir. Crit. Care Med. September 2007, 176 (6): 532–55. PMID 17507545. doi:10.1164/rccm.200703-456SO. ^ Braman, SS. Chronic cough due to acute bronchitis: ACCP evidence-based clinical practice guidelines.. Chest. January 2006, 129 (1 Suppl): 95S–103S. PMID 16428698. ^ Wenzel, RP; Fowler AA, 3rd. Clinical practice. Acute bronchitis.. The New England journal of medicine. 16 November 2006, 355 (20): 2125–30. PMID 17108344. ^ Fleming, DM; Elliot, AJ. The management of acute bronchitis in children.. Expert opinion on pharmacotherapy. March 2007, 8 (4): 415–26. PMID 17309336. ^ Vos T, Flaxman AD, Naghavi M, Lozano R, Michaud C, Ezzati M, Shibuya K, Salomon JA, Abdalla S, Aboyans V; 等. Years lived with disability (YLDs) for 1160 sequelae of 289 diseases and injuries 1990–2010: a systematic analysis for the Global Burden of Disease Study 2010. Lancet. December 2012, 380 (9859): 2163–96. PMID 23245607. doi:10.1016/S0140-6736(12)61729-2.